Dell Outlet promo codes listed here provide extra discounts on refurbished laptops, desktops, servers, and monitors. Use the Dell Outlet coupon codes listed here to get a great deal on an Alienware laptop, XPS desktop, Chromebook, PowerEdge server, Latitude laptop, Optiplex desktop, or a computer monitor. 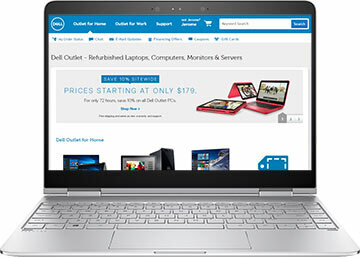 The Dell Outlet Store is a discount source for refurbished laptops, desktop computers, services, and computer monitors. It includes home and small business systems, so you can save on brands like Alienware, XPS, and Inspiron for home and studens as well as Latitude and Optiplex business machines, or even PowerEdge servers.